At the end, I’m somewhere in the middle. The book is definitely not for everyone, but for those interested in making an initial foray into the world of natural wine, it’s a pretty good introduction. By natural, Ms. Feiring means the wine contains pretty much nothing but what was in and on the grapes as they came in from the vineyard – and pretty much everything that came in from the vineyard. Stems? Most winemakers I’ve spoken to say that they must be removed or they will make the wine bitter (although depending upon the grape and the character of the vintage, some will leave a small percentage of the stems to add structure.) Ms. Feiring believes stems add “structure, spice and fragrance, especially as the wine ages,” and she prefers to keep them all. Sulfur? Winemakers will definitely disagree about how much sulfur to use, but most believe at least some added sulfur(as opposed to the sulfur that is a natural byproduct of the winemaking process) is necessary. In fact, wines made without sulfur can be volatile, and the bottles might explode if they are not handled properly. Ms. Feiring is almost violently opposed to the use of sulfur. Yeast? Grapes come with everything they need to turn themselves into wine, but most commercial wine is made with cultured yeasts from companies like Scott Laboratories. Ms. Feiring wants only the natural yeast that comes with the grapes, which she believes will aid in providing the best expression of terroir. None of these ideas make Ms. Feiring a wild-eyed radical. Everything she advocates will find at least some support, and even broad support, depending upon the issue. What I found objectionable was how dogmatic she was about her ideas.For example, she is given an opportunity to make wine her way from Sagrantino grapes at a friend’s winery. She crushes the fruit herself, employing a technique known as pigeage, which in this case involving stomping them with her feet. After the first pigeage session, she sees one of the cellar workers walking toward her fermenting juice with a bucket. Overtaken with the thought that he is about to douse her juice with sulfur, she runs screaming after him, only to find out he is carrying carbon dioxide to keep the fruit flies off. Later in the process, when it turns out that the wine is heading toward an unacceptably high alcohol level, she cannot bring herself to do what seems obvious, which is to add some water. She talks about it with the vineyard owner as though they are trying to decide whether to have the family dog put to sleep. The addition of water would be illegal in much of the world, but it is allowed in the United States, and it is an easy and inexpensive way to reduce the alcohol level. My opinion? Too many wines today are made with overripe fruit that leads to unacceptably high levels of alcohol. Bringing the ABV down is a virtue, not a crime. On the other hand, she did agree as the grapes were coming out of the field to run them through the destemmer, reasoning that Sangrantino is already quite tannic, and that letting it ferment with the stems could lead to unacceptable levels of tannin. Score one for Ms. Feiring. Viticulture and winemaking are areas that lend themselves to romantic ideas, and Ms. Feiring is more romantic about the subject than most. It starts with the way grapes are picked and brought to the crush pad. She would have the task done as she remembered it being handled in the Europe of her youth, when she joined students, tourists, and others in a lengthy harvest that allowed them to inspect each cluster visually, dropping bad fruit and sending only the best back for the crush. She was surprised to see grapes picked by Mexican workers, who simply picked everything, and sent it all back to the sorting table. I can’t disagree entirely. For a lot of reasons, I think it’s best to sort first in the field, rather than let a lot of really bad fruit make its way to the sorting table, and I remember feeling dismayed as I watched hired workers tear through the vineyard, finishing whole rows before I could finish a single vine. But I also understand that once the grapes are ripe, you only have so much time to pick them, and at some point, a vineyard is so large that rapid picking is almost unavoidable. A college student or vacationeer may find it romantic to pick grapes slowly so that each bunch can be inspected, but a laborer who is being paid by the pound or the lug is justifiably interested in working fast and getting paid. And the vineyard owner is interested in getting the grapes in on the day when they are perfect — not a moment sooner or later, and certainly beforeit rains and the harvest has to be put off for another week. So, in the end, I think I would fall some place in the middle, and that realization is what made this book valuable to me. Going into it, I just assumed that wine had to be made with regular shots of sulfur, commercially-made yeast, and a variety of enzymes and chemicals. That may still be true, and I have yet to actually make wine on my own from freshly-picked fruit, so I’m not pretending to have all the answers. But I did get a new perspective from Ms. Feiring, and now I would say that my philosophy is to do as little as possible in the way of intervention. That “little” might still turn out to be a good deal more than Ms. Feiring would like, but I think it will be less now than it might have been a year ago. And I will definitely be aiming in a different direction. 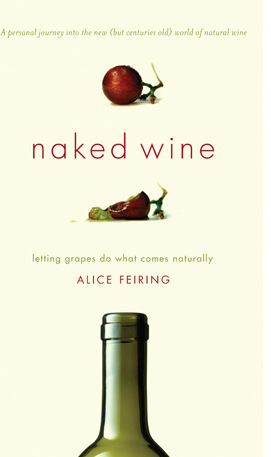 In the end, Ms. Feiring’s book is as much a personal journey as it is a primer on natural wine. She explains her subject by recounting in detail events in her life and conversations with some of the field’s leading figures. She clearly knows a lot about wine, and if you’re new to the subject, if you like her writing style, and if are interested (or at least not annoyed) by the details of her life, this is the kind of book that can give you a new perspective on a familiar subject. I’m just getting to know Alice but she seems loud, slightly hypocritical, and above all else, naive. A recent post on her website [http://www.alicefeiring.com/blog/2012/09/a-new-way-to-ameliorate-your-wines.html] advocates adding California port to “punch up” your red wine. 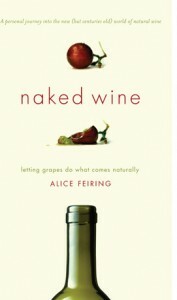 How is that natural or naked wine? Dear DC – Thanks for taking time to leave a comment. I just looked at the post on her blog, and I have to say, I’m quite surprised. At one point in Naked Wine, she obsesses over the suggestion that water be added to her Sangrantino to bring down the alcohol level. In a world where alcohol levels appear to be on the rise, I would applaud any effort to bring them down. Adding Port appears to be a step in the opposite direction, and I can’t understand why she would sanction it. It certainly doesn’t seem natural.